We'd love to get a great gallery going of creativity and authorship. OK, I have 3 Android devices, each with the latest version of Evernote (verified the versions to be 5.8(1058073-public-com.evernote)). 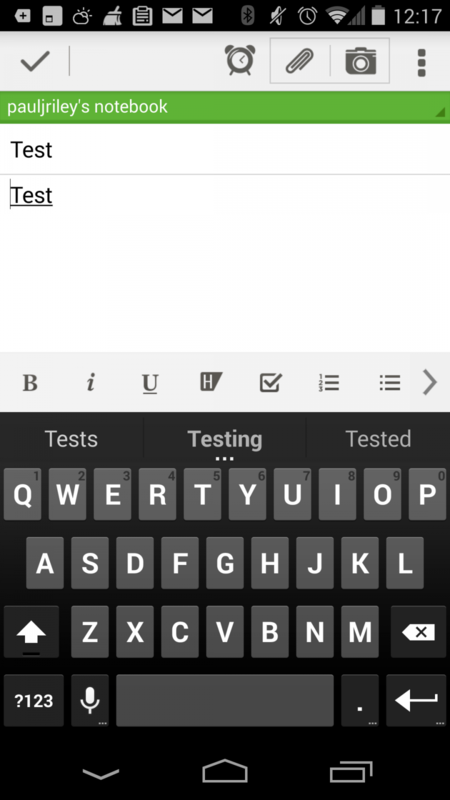 On my HTC One phone, I can create a note and I see the Add Handwriting button at the top and it works great. On my Kindle Fire 7 HDX with Google Play, I can create a note but I do not see the Add Handwriting button, only the old style paperclip and camera. I can only enter text into the new note. Funny thing is that I can open the note with handwriting created on the HTC One and it will allow me to Add Handwriting to that existing note when I tap on the marked up area. On my HP Touchpad with Android 4.3, it behaves the same as the Kindle Fire HDX. We need a thinner pen size on android tablets! It's perfect with s-pen on galaxy note, but please let's us draw more detailed with a smaller pen size. When will it be available for iOS? Hurray! It appears my app updated without me even realizing it. Having the handwriting feature isn't so important for me right now, though I hope to eventually get one of those fancy styli that writes like a pen. However, the previous lack of Clickable Links was a huge PITA for me. I just checked and it seems to have converted all the notes I've made with unclickable links that I hadn't yet fixed on my pc. I only checked a few out of several dozen, but they are working, so I assume all the others are too. And I made a new test note with a link that worked great too. The Note link feature is a much more meaningful addition for me. I've installed the latest update on my Nexus 7, but when I run Evernote and go into a note, I do not see the pen icon, been waiting for this for a long time as I have a Jot Pro and am disappointed with the support for this device on the Android platform. Have also tried this out on my Nexus 5 and still no pen icon, am I getting the same version of the app to everybody else? I see this working on my Nexus 7 (2012 edition). When editing the note, the pen icon is at the right-hand side of the toolbar at the top, just to the left of the menu icon. Have gone though the various video's out there showing the handwriting feature working, the screens just don't tie in with what I see, instead of a pen I see a camera, same on both devices. Could this be because I'm located in the UK and not the US, usually takes some time for software updates to get this side of the pond. Screenshots from both devices shown below. Screen shots of support information below. Curious -- I'm running the same version, but I see the pen instead of the camera. I must be missing something, some setting. OK, try this: tap on the paper clip, and under the "Create" section, select "Handwriting". I'm thinking that that could be made more obvious. Maybe a dropdown panel with the various options, like the editing tools panel that can be hidden for more usable screen space? Thanks, Jeff. That fixed my problem. I just "assumed" that it wasn't working since I saw a paperclip/camera on the Touchpad and Kindle, and then I had a paperclip/handwriting thingy on my HTC One. Didn't think to tap the paperclip to see options. It wasn't obvious to me, either. It just seemed like something had to work, so I just guessed and tried out the paperclip. Lucky me. Works for me too, great work, thanks. When will the new version be on the Amazon Appstore for those with Kindle Fire HDXs that haven't hacked on Google Play?? This is a godsend for the Galaxy Note, thanks for the awesome update! I remember asking a while ago for Skitch to be made a bit more handwriting-friendly, but this is an even better implementation than I was hoping for. This is the message I get when I try to open a pdf i Evernote on my Samsung Galaxy Note 8.0 tablet: You have the wrong processor architecture for the version of Evernote you have installed. Great work, Evernote! The handwriting is really awesome! Loving it! LOVE IT! LOVE IT! LOVE IT! I know we've been pushing for this, and you've listened and delivered with style. 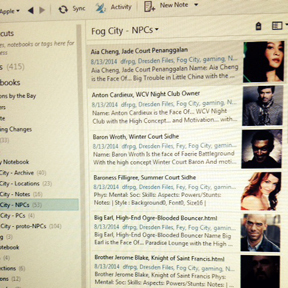 This is a step-change in Evernote's usability and accelerates capture on a par with the awesome Web Clipper. For me, there's an important social aspect too. When sat in meetings and interviews, it still seems to be considered impolite to be tapping and typing on a device. Yet taking hand-written notes is not only more acceptable but somehow reinforces that you are interested and engaged. I am not sure this is an Evernote thing, but an Android thing. The two menu buttons there (paperclip and what ever shows) is what you see in android. For example, look at an image in Gallery, the two buttons are share and your last used share option. The rest are hidden. The buttons in Evernote work the same and, so show the paperclip (containing all of them) and then the last one you used. This is a great update but it crashed today so I had to switch back to S-Note and lost the 4 pages I already wrote. When the bugs are worked out it will be a great tool. this looks one of the most useful update to the date. but i have a big problem. i have galaxy s2 (gt-i9100) running 2.3.3 and live in india. when i installed and run latest version of evernote and tried to create a note with handwriting, i didn't see the pen icon. i tried paperclip icon on top and it didn't show any option for handwriting so i selected "show more" from that menu but it didn't show either. 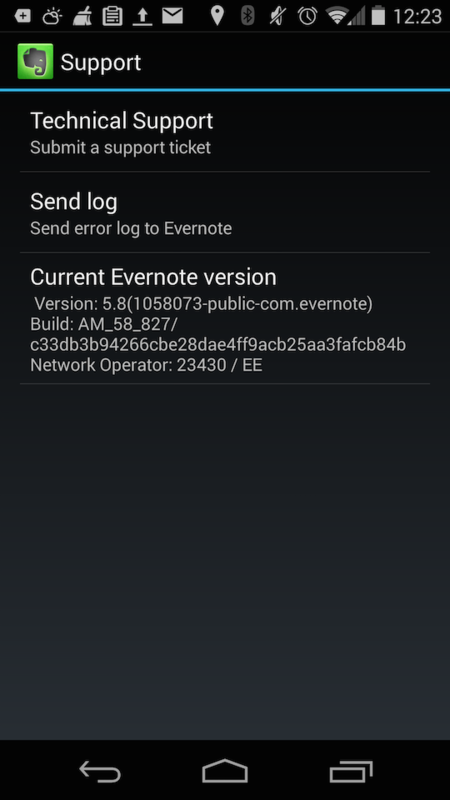 after that i tried evernote on my wife's galaxy grand (gt-i9082) running 4.1.2 and logged in with my account. when i created a note in there it showed the handwriting option and i created one using that. then i synced it with my galaxy s2, it showed the note with handwriting there and i selected it to edit. but when i clicked the handwritten portion in the note it showed me as and .jpeg file so that meant i couldn't edit it either. please someone help me on this problem. i want to use handwriting in my galaxy s2 'cause i work on a construction site and there i need to write down various notes on the go and this addition of handwriting will help me a lot. so please help me solve this problem. Same with my Droid X running Android 2.3.7. When I switch to handwriting mode, almost immediately after I start a handwriting stroke, EN crashes. Seems to work fine on another device running Android 4.0, so could just be an issue with older Android versions. Hopefully it's an easy fix as lots of people are still running Android Gingerbread because they got into contracts late in the phone's production life or because they are using a mobile reseller, many of whom limit users to 3G phones. What is the note link feature? I assume this is something new in the latest Android app, and not the existing ability to create a link within a note to another note? I concur with this. Even the smallest pen size is too thick. Great to have this feature developed (esp. for Galaxy note devices), and a little tweeking to enhance will go a long way to making this my default note taking package. 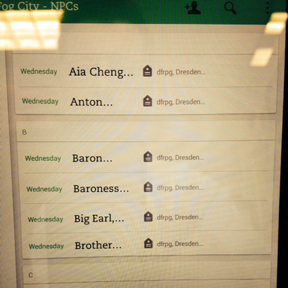 The note link feature's basic function - linking one note to another - hasn't changed. What has changed with this newest Android update is that now when using the Web Clipper on your Android device, it now creates a *clickable* link, not just plain text stating a web address. Previously, users had to go into their desktop machine to turn these web addresses into clickable links. Also, the handwriting capability is brand new to the Android EN app. I'm working on the Galaxy Note 10.1 2014 edition and here are some improvements I'd love to see. I agree. Those of us with an s-pen also need to have the option to write without our hand messing up our writing. It seems when the s-pen is hovering over the screen, it ignores the hand just fine, but it would still be much easier to ignore the hand entirely. You can also get s-pens with an eraser side. It would be nice if that worked too. 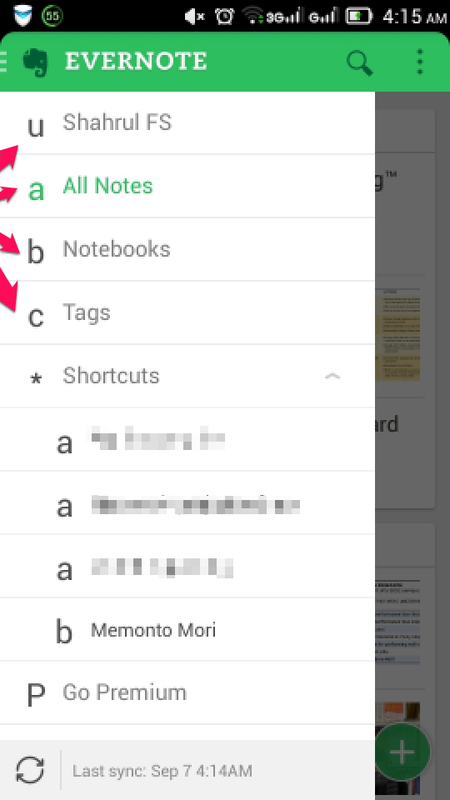 If this part of Evernote worked as well as Samsung's s-note app, I would use nothing but evernote. For me, it would become the ultimate note-taking app. This is an awesome feature, and thanks for going for Android first. One thing that I was surprised to see though was that the handwriting is not at all integrated with Skitch. There's no way to save the handwriting as an image to be edited by Skitch. While I understand that the handwriting is saved in a way that is not an image (and can be opened again for editing), at least include a feature "export to skitch" or something similar! Currently, the only way to do that, is to export the handwriting as an image, which sends it somewhere deep deep into the phone where the gallery app can't even detect it. I have to manually browse there, find it, open it, and choose to edit in skitch, and then save it into Evernote... crazy. And don't forget that Skitch-created notes are not editable from anywhere else besides the skitch app. Skitch is crucial for handwriting notes because it allows you to label things. Did you try to write something with your finger before? eek. Skitche's arrows and such are also very valuable. This new version is a big help for me. Now I can edit my notes on my Android tablet, never used to be able to do that. Also, I can use my Note 2's stylus to write handwritten notes. Great addition! My only request is that the handwritten note be sized to the handwriting on it. Right now, I am including notes with 2 lines of writing that take up several inches of space in my Evernote note because the background for the handwriting is a fixed size. Is there no way to make the handwriting background smaller, to fit the note? I've been waiting for this for my Nexus 7 for a long time. The advertisement uses a Samsung Stylus and I'm wondering if there is a small stylus for the nexus yet or if Evernote is thinking about creating one. Does anyone know of a good one? I don't see the pen icon either on my mobile. My mobile is a SFR one, the Startrail 4, and I have 4.2.2 version of Android. What do you see when you click on the paperclip? Remember, you may need to click on the "See all..." entry at the bottom to see all attachment options. I also do not have the handwriting option. under Create (after clicking on See More): Camera, Audio recording, Speech-to-text, Document camera, and Skitch. Yes, the '+'is new to the latest version, I think. Not sure about the missing handwriting option; maybe it's an Android version thing? I'm still waiting for an update to my Kindle Fire, so I'm not sure on that. When i create a Handwriting note on one of my Android devices i can edit it with the Handwriting tool on the other. I create a note an my Galaxy Note 2 an make an Handriting attachment to the note and write somthing on it. Then i open the note on me tablet. Is this a bug on my Phone or Tablet? Can anybody else test this ??? I tested it. I made a note on my Galaxy note tablet and tried editing it on my HTC phone. I got a message reminding me to be in editing mode. Somewhere you should see a pen and paper icon that is the icon to edit any part of that note. It is confusing because it looks similar to the icon to create a new handwritten note. Once I clicked on the edit icon, I could then click on a handwritten note, and edit the handwriting. Be sure both devices have the latest version of Evernote. If none of that works, I'd contact Evernote support because it might be a bug. They've been very helpful. For someone who has the same bug. I earsed all data on the tablet and the phone (the app Data in the Appmanager). After this I reinstalled Evernote on both devices. 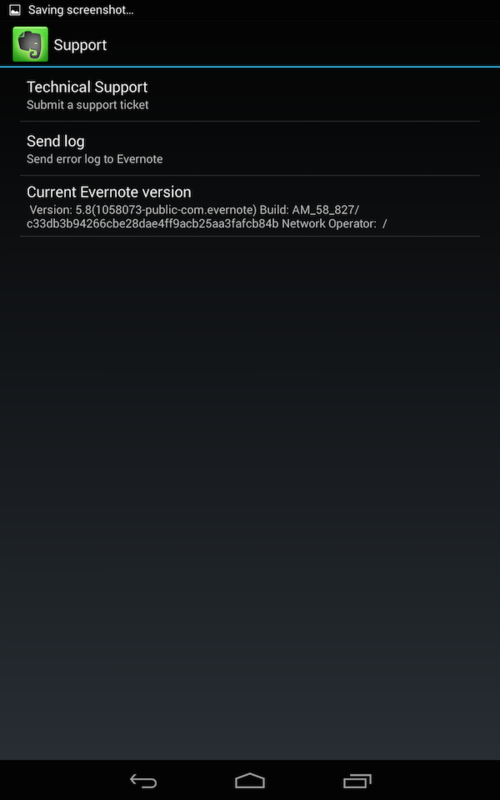 I have a Sumsung Galaxy Player 5.0 with the latest Evernote from Google Play. 1) There is no paperclip icon. 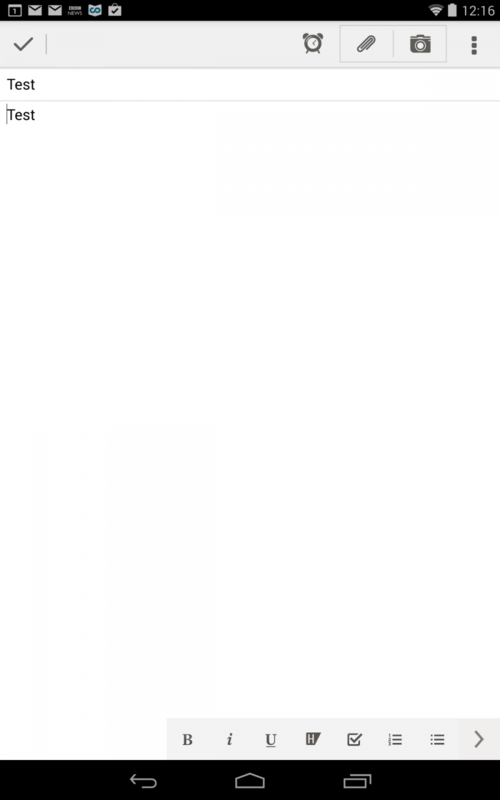 Instead, the "+" icon as described above. 2) When clicking on the "+" icon, there is not a handwriting option. 3) When clicking on "see all", there is still no handwriting icon. I'm confused. Is anyone else having this issue? What's your Android version? Handwriting may not be available on earlier Android versions. This is awesome, I've been looking for exactly this function in an app for years, and now I've finally got it! Just one thing, are there any plans to support the pressure sensitive S-Pen in the future, for varying line thickness? To be honest, this is quite disappointing. I mean it's great there's handwriting, but it's done on a level that is so simplistic and non useful when compared to other applications like S Note, that it makes me not want to use it. The writing is sloppy, can't adjust size or anything. Please improve this to complete the evernote experience. I've spent a week plus researching alternatives just because of how bad this handwriting feature is in evernote. Concur! When will it be available for iOS? I got the 5.9.1 update on my Kindle Fire HD, and the UI is making it really hard to use. When sorting notes by updated date, the note shows the way it used to most of the time, with the title, intro text, and a picture as appropriate. When sorting notes by title, however, the note title gets clipped short by having to share space with the date updated and the tags. I can't find any way to fix this, and it cause great distraction and difficulty using it as a reference. I upgraded to the Premium account, hoping that the UI issues would be addressed in the grayed out Navigation tab, but no luck. That just controlled whether or not you could see "Market" or "Explore Evernote" in the app. In general, you're not going to see much in the way of UI differences between the free and the premium versions of Evernote. You usually have differences in capacities (e.g. more upload capacity) and capability (offline notebooks, read/write notebook sharing, etc.). The problem is that, before 5.9.1, I could sort by Title and actually *see* the Title on the Kindle HD app (Android I presume). This just makes the UI almost unusable for my purposes. Again, none of this is nothing to do with premium vs. free. Not the sort-by-title behavior, and not the navigation bar (a different problem), which seems to be what you're implying. The change to sort-by-title has now replaced the prior List View, a design change I don't care for, and have reported it in the Evernote for Android beta group in Google+. The newest version of the android app has a problem. The icon to expand/bring up the text editing menu disappears when you have your device screen in Landscape view. Not a biggie on a phone (for me), but on a tablet it would be a *major* PITA. And eat screen space since tablets are usually wider than they are high so that's how people generally use them. I sure hope this is a "just" a bug and is fixed very soon. Come on guys (EN), though still a free user - not by choice - I'm also currently one of your biggest cheerleaders here on the Forum... First the support for free users being so lengthy for months now, without any official notice about why - even though we know the forum moderators have brought it up to you more than once - and now a very important, basic feature is missing from your latest android update? Posting a new Topic from my phone. It keeps asking me to choose a Category, but like a poster who recently had this issue on her Mac, there is no way that I can see to actually do that. Up until now when I post from my android phone, I go to the forum home page, then click on the appropriate section and start a new topic. I add the tags I think are fitting and post. I do this from the mobile version of the forum that comes up automatically when I log-in. When it didn't work just now, I brought up the full site and I still can't see any area where I can select a category. I can reply to existing threads, but not start a new one. At least not from my phone. Does anyone have any ideas? Then there's the issue of the formatting icon disappearing when you have the screen in Landscape view so you *have* to flip back to Portrait to edit a note (if you want to use formatting options). Also, the font has changed to a scrawnier one, making it harder to read on a small screen. I can see Bullets and Indents, on my 7" tablet. On my phone, they're there too, you just need to slide the toolbar to the left. 5.9.2 beta for both. Hello, guys. Could somebody please help me? I just updated EN for Android and in this new version the icons are missing. Any ideas why? Thanks! Any idea when Copy/Cut/Paste between notes will be available. It't great to be able to select and move around the same note but I have reoccuring items that need to be moved from one days notes to the next. I can be more patient if I know it's on the agenda for a future release and potential time frame for that to happen. thx. +1 a thinner pen size would be great. I've noticed on several of these forums and a couple of blog posting the discussion of handwriting. MANY iOS users (especially iPhone) are requesting handwriting on these devices; however, it appears NO ONE from Evernote responds to these requests! I have searched several places and can find no response from an Evernote representative. Does Evernote think ignoring the requests is a best practice in responding?? If I have missed your response, then please advise. Are you listening? ?